We find some of our favorite cosplay on escalators. Comments Off on We find some of our favorite cosplay on escalators. Conventions 2017 – Emerald City Comicon! We’re on our way to Emerald City Comicon 2017 (March 2 – 5 at the WA State Convention Center), and this year is our biggest presence there yet! Check out our line-up of panels, freebies, and autograph signings! The post Conventions 2017 – Emerald City Comicon! appeared first on Funimation – Blog!. Comments Off on Conventions 2017 – Emerald City Comicon! Artist Corin Howell (Bat-Mite and Transformers: Windblade) will be a Comic Guest at ECCC! 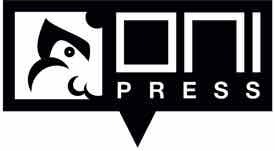 #ECCC Visit our booth #212 for these signings with Oni Press creators and get your Oni Press staff buttons too! All is not well in suburbia in Alabaster Shadows, from Matt Gardner and Rashad Doucet, coming this December. Blood Feud, a Southern tale of vampires, necromancers, horrific spiders and family feuds that survive beyond the grave, from Cullen Bunn (The Sixth Gun, Hellbreak), Drew Moss (Terrible Lizard) and Nick Filardi (Helheim). Coming this October. A special Tenth Anniversary Hardcover Edition of Elk’s Run, Joshua Hale Fialkov & Noel Tuazon’s striking, vivid story of small town horror, returns this November. Lion of Rora, a historical epic from Christos Gage & Ruth Fletcher Gage (netflix​‘s Daredevil) and Jackie Lewis, coming this June. Oyster War, a beautifully illustrated, historical graphic novel coming to print this September from three-time Eisner nominated cartoonist Ben Towle’s critically acclaimed webcomic. Hear the latest about The Sixth Gun’s tall tales in a new multiversitycomics interview. Stringers, an action-packed new miniseries about crime, corruption and the perfect shot. From Marc Guggenheim (Arrow) Justin Greenwood (Stumptown) and Ryan Hill (Stumptown, Rick and Morty), coming this August. Stringers writer and Arrow showrunner Marc Guggenheim tells comicbookresources about his tale of L.A. crime. Our pre-Emerald City Comicon event, I Heart Comic Art, was a huge success! 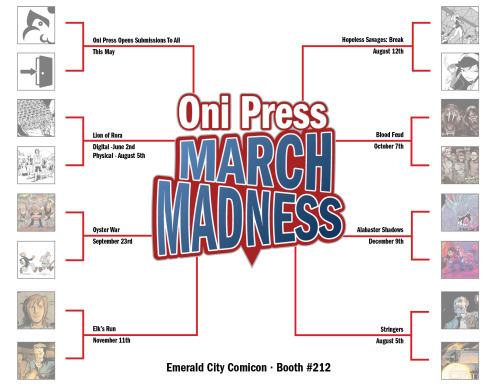 #ECCC Come by booth #212, in front of the skybridge, and complete these legendary tasks to collect the Oni Press staff buttons!